The client had planned on encasing the metering station in unreinforced concrete, however this was found to be inadequate. Clark Engineers developed a design using the reinforced concrete to provide the required stiffness. FRP stiffeners were added to the flat sides with a grid of reinforcing steel running through them and in front of them (Left photo). 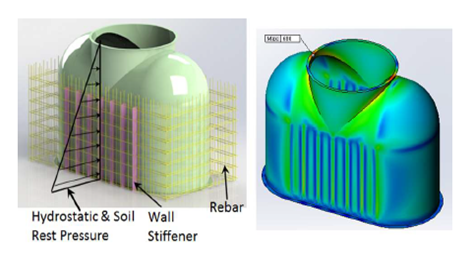 The right sketch shows the resulting stiffener stress in the flat walls (Right photo). By using reinforced concrete and tying it to the flat walls, the structural FRP thicknesses were minimized, saving the client money and creating a design that could be manufactured. 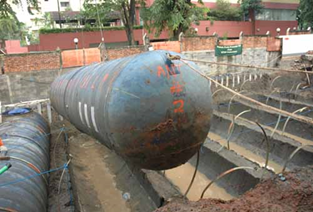 A major oil company contacted Clark Engineers to do a forensic investigation of 35 failed FRP underground storage tanks (UST) located in a South East Asian country. 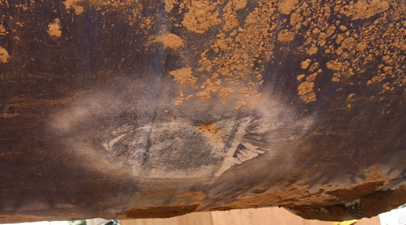 The investigation included planning a geotechnical investigation at six sites and documenting data during tank exhumation of all 35 tanks. Also the design and manufacturing quality of the tanks were reviewed. Many tanks did not have UV Labels (Underwriters Laboratories) as required for UL listed tanks.